Why your governor is in a panic? An extra-ordinary meeting of Nigeria’s governors took place last Tuesday at the Presidential Villa. So extra-ordinary was the meeting that Governor Ayodele Fayose of Ekiti State who has made it a point of principle not to honour the Muhammadu Buhari administration with his presence in the Presidential Villa made it to the meeting. 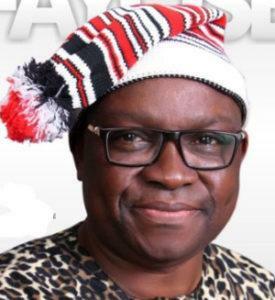 The previous week when the governors decided to violate the constitution by appropriating $1 billion from the Excess Crude Account of the Federation, Governor Fayose was as usual absent. After attending the first meeting of the council in the Buhari era in 2015, the Ekiti governor made it a matter of principle not to attend anymore. However, the meeting of the governors last Tuesday was so important that Fayose had to break his policy. Besides the extraordinary presence of the Ekiti governor was the presence of the speakers of the 26 State Houses of Assembly. It was to emerge that the extraordinary meeting had to do with the ongoing amendment of the constitution. The panic of the governors apparently had to do with the proposal to grant autonomy to the local governments as envisaged under the amendments pushed through by the National Assembly. It was understandable that governors who have in the past sabotaged previous attempts at granting autonomy to the local governments would be disturbed by the fresh proposal given the manner they have suppressed their local governments mainly because of the funds accruable to them. However, the fact is that governors have practically nothing to do with the process of constitution amendment and as such that meeting which took place last Tuesday should be regarded as a panic response to the move to aerate the democratic process that virtually all of them have suppressed at the local governments. Not only have the governors refused the local governments to manage their funds, but they have also gone further to suppress the democratic franchise at the local government level. Whereas Section 7 of the 1999 Constitution specifically stipulates that “The system of local government by democratically elected local government councils is under this Constitution guaranteed;” virtually all the governors have at one time, or the other violated this provision. Section 7 makes it an abomination for caretaker committees or sole administrators to be appointed for local governments. However, it has been the practise for governors to appoint sole administrators or caretaker committees at the end of the tenure of the local governments and procrastinate over the conduct of local government polls. What is wrong for one set of democratically elected local government councils to hand over to another set of democratically elected councils just as a governor hands over power to another? How would the governors react were the president to strangulate the Independent National Electoral Commission, INEC and it became unable to conduct governorship elections at the required time? How would they react to the appointment of sole administrators in the states if that were to happen? Even more vexatious is the practice of newly elected governors dissolving the local governments that they met in office. So fundamental is this issue that a worried Speaker Yakubu Dogara, a year ago called for the impeachment of any governor who refuses to conduct local government elections. This abhorrence of democracy at the local governments is one that is common to both All Progressives Congress, APC governors and their colleagues in the Peoples Democratic Party, PDP. Notice that whereas Governors Fayose of the PDP and Abdulaziz Yari of the APC disagreed on the withdrawal of the $1 billion from the ECA, but do not quarrel when the issue of local government democracy is concerned? This assault on the democracy by governors must come to an end and Nigerians must not in any way soothe the discomfort of the governors on the proposal to grant autonomy to the local governments. After their imperious venture the previous week in authorising the release of $1 billion from the ECA, the idea that governors are in a panic over the proposal to amend the Constitution to grant autonomy to local governments is one that Nigerians should readily welcome. The post Why your governor is in a panic? appeared first on Vanguard News.